Bud loves cBeebies and one of his favourite shows is Mr Bloom's Nursery, we're regular viewers of Mr Bloom and his veggie friends and Bud really takes an interest in how they grow (I just wish I could get him to eat more of them). 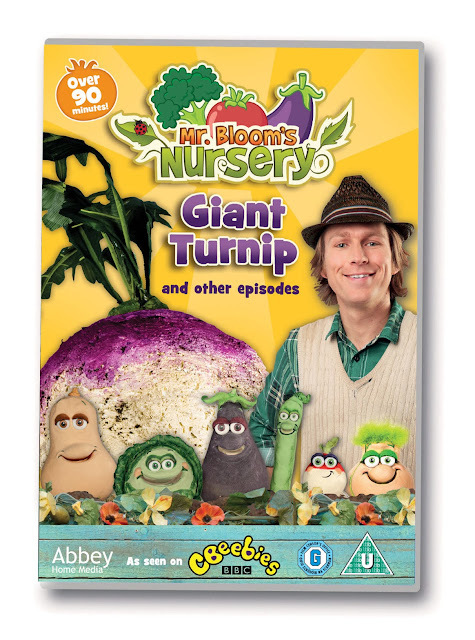 We recently received a copy of Mr Bloom's Nursery: Giant Turnip from Abbey Home Media, which features four episodes from the series. Now, we've seen all of the Mr Bloom episodes I think, probably several times but, as it is such a favourite here, it is really nice to have a DVD with four great episodes to watch any time we like. This was a fab selection of titles for us as Music and Worms are two of Bud's favourite Mr Bloom episodes. We love the songs in Music and Worms always gets Bud excited about the compost bin that we have in our garden as they explore how worms help to make compost. I think Bud wishes our compost bin was a little more like Mr Bloom's Compo the Compostarium really. We've really enjoyed watching the DVD together. It runs for over 90 minutes so is really good value at around £7 on Amazon. I think this would make an excellent stocking filler gift for any tiddlers you know who are fans of the show. Bud was so excited to receive the DVD and we had to watch it right away, I can see it becoming a popular addition to our collection. The lovely people at Abbey Home Media have supplied me with three copies of Mr Bloom's Nursery: Giant Turnip to give away to three of my lucky readers. To enter simply complete the Rafflecopter widget below, and remember to read the terms and conditions.